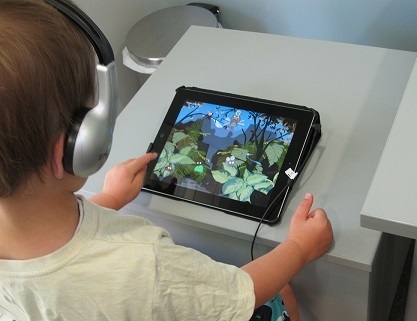 Feather Squadron is an iPad app that can quickly screen or perform thoroughly and accurately measurements of auditory processing abilities by playing a series of video games. The assessments are automatically available from within the Acoustic Pioneer website (Click here to sign up for free). More advanced skills such as language, reading, and learning are reliant on normally developed auditory processing skills. Studies consistently indicate that strong auditory processing skills are required to develop language and reading abilities. Experts estimate around 5-10% of children have an auditory processing problem, yet very few are being assessed for their auditory processing abilities. Feather Squadron allows professionals to assess a range of auditory processing skills in a fast, fun, and easy way! Many variables can affect a child's ability. For example, reading ability can be affected by knowledge of language, psychological and emotional state, general IQ, exposure to reading at home and many other variables. Auditory processing is an important skill that Language and later reading are based upon. If the core skills are not as strong, logic tells us that the higher level skills will be more challenging to develop even with top down skills compensating. If we can isolate and improve the core skills, then we should be able to make more progress with higher level skills, but they will still need therapy and training for the higher level language and reading skills. Specific Language impairment, APD, and other areas can be affecting a child's development simultaneously (Sharma, 2009 - Journal of Speech, Language, and Hearing Research) so unless you assess each area, you really don't know the entire picture of your client which bears impacts on your therapy plans and even the overall progress we all want to make. There are several published journal articles on ways to improve auditory processing areas with directed and adaptive auditory training. We have developed 2 apps that are targeted at the most common areas and the areas that are the strongest correlates to reading and language delays. Read more about our training apps when you have signed up for an account.